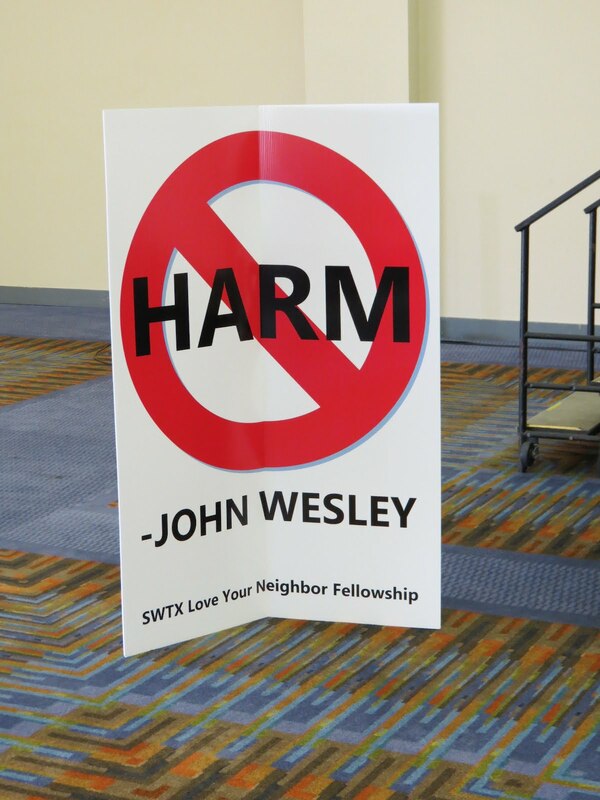 Many of our MFSA members and supporters continue to be appalled at the mean-spirited cloud that surrounded the recent UMC General Conference in Tampa. There was a need to recognize the pain that was created there, particularly toward our gay, lesbian, bisexual, and transgender brothers and sisters, but also to all who believe God’s love extends to all persons. We continued at Annual Conference with the “Southwest Texas Love Your Neighbor Fellowship”, providing intentional witness through wearing of stoles and sharing resources between our conference MFSA and RMN teams.On Friday evening, over 45 of us gathered (over some great seafood) to share our concerns for our church family.Then on Saturday morning, Rev. Georjean Blanton and Rev. John Wright conducted a communion service of “Lament and Hope” that was very meaningful. 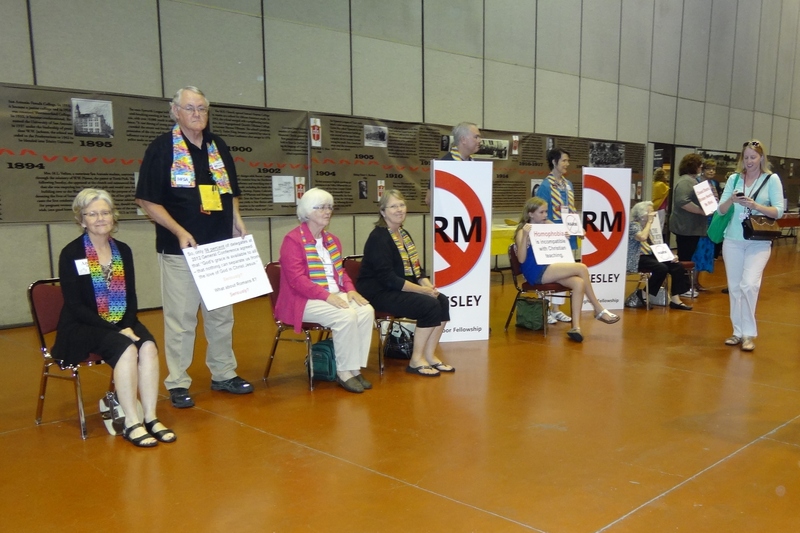 Following the report to the Annual Conference by the delegates to General Conference, Mr. Jeff Sturgeon of Travis Park UMC-San Antonio asked to speak as a point of personal privilege. Mr. Sturgeon spoke of the hurt and pain he personally feels as a result of GC2012, and asked all the delegates assembled “How will you express God’s love? What will be your Christ-like response to my family and those like me?” (full text) Then the Bishop offered a prayer asking for healing. During much of the afternoon session, our SWTX Coalition stood in quiet witness with signs expressing our concerns. You Texas progressive Christians are really something else! In the thirty years I lived in Texas, I never found the kind of winsome, passionate, justice-seeking Jesus-lovers that you folks seem to embody. Now I’m a reconciling pastor far from home, but I take great delight in knowing that some “self-avowed, practicing United Methodists” are helping to bring God’s Reign of Justice and Love to life — right there in the heart of Texas! Halleluia!!! Please encourage Jeff Sturgeon to press on in faith, hope, and love. We need more of his courage and truth in UMC.